Look how cute he is in his little gown & cap. He was grinning in this picture. Now he asks me often if he will have to ride in the bed. 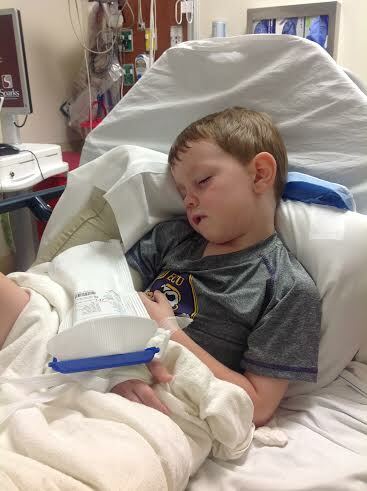 He had a tummy ache at school last week and was afraid he was going to have to ride in the bed again. He is terrified of it. He remembers going into the OR, and having to breathe into the mask & count. I hated not being able to be there and hold his hand through it. 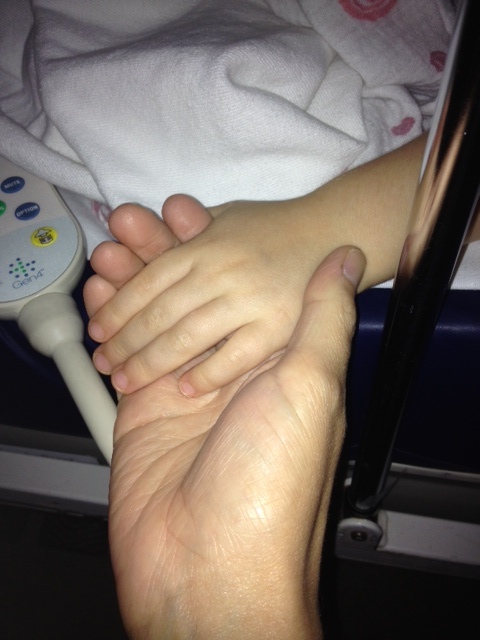 We were told he would not remember most of being at the hospital, but he remembers ALL of it. He remembers his good friend Stacie coming to see him in pre-op, and everything leading up to finally giving in to the anesthesia. 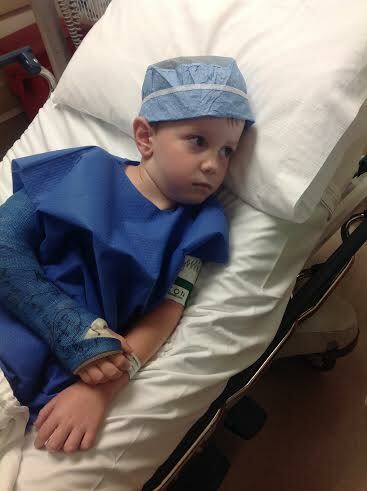 Dr Bradshaw said he is one strong and tough dude, and that will serve him well in life. He was crying when I finally got to see him in post-op. 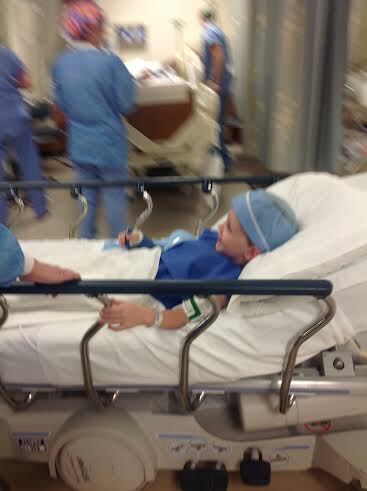 The nurse told me that every child she has ever had in post-op has woken up that way. The Demerol made him very nauseous, and they gave him some Phenergan to ease it, but poor Noah threw up until he went to bed that night. It was awful! He was hurting, scared, nauseous, and just plain miserable in this picture. And incredibly precious. I want to climb back into this picture and hold him again. The good news is that from that surgery, he went from the 30+ degree angle to an 8 degree angle. I’d say we made the right decision. And though we normally use Mercy Hospital, Cooper Clinic sometimes uses Sparks OR. I will say this about Sparks: I have never had nicer people to deal with than we did that day. From admission to pre-op, waiting rooms, etc, everyone was above and beyond what we had experienced before. The nurses were fantastic. I don’t know if it is like that every day there, but God certainly placed lovely, understanding, and very competent people in our path that day, and we are so grateful for it. One of the worst moments of my life. Maybe the worst. I was in the playroom sorting books & Michael yells at me to come NOW. I knew something was wrong. I run. I see my beautiful boy, with his arm hanging there & it is grotesque. It is honestly horrific. 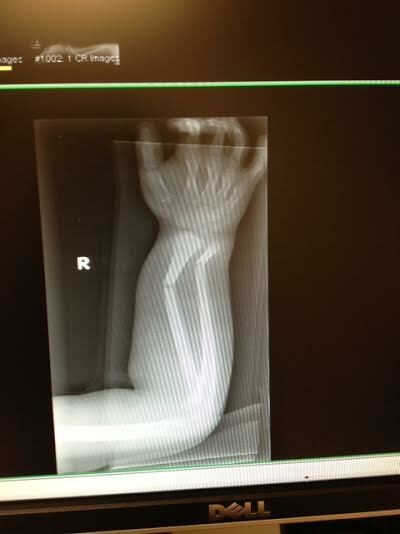 His forearm was basically popped up in the middle. My stomach dropped. I had about 7 seconds of insane panic. 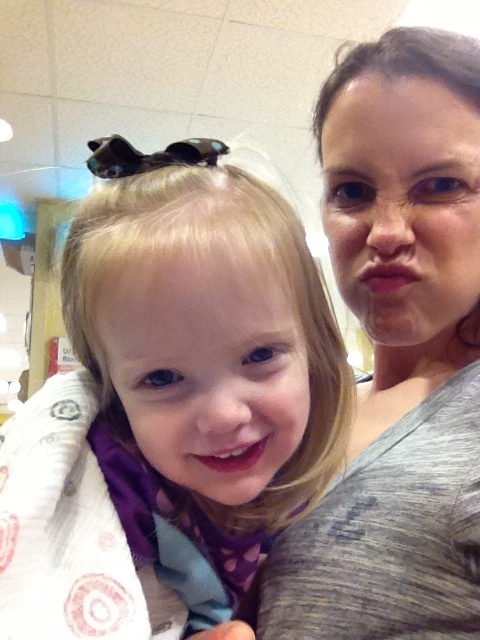 It was just such an odd thing to see, something so wrong with my child that I couldn’t wrap my head around it. I know that fractured arms happen to lots of people, but in that moment those thoughts were far away. 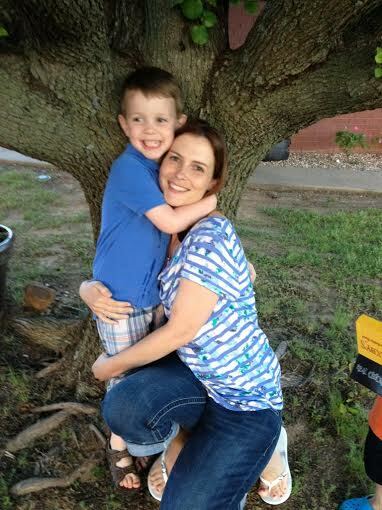 I just knew that my precious little boy was broken, and in that instant my heart broke, too. Noah had been on his knees on the bench in the kitchen picking pepperonis off the pizza his daddy was prepping at the bar. Michael went to move the bench back to the table with Noah still on it and he lost his balance, falling forward & I guess bracing his fall on our hard tile floor with his arm. He kept crying to his daddy, “you broke me, you broke me.” Michael was and still is completely crushed about it. His heart broke, too, because never in his lifetime would he intentionally hurt his little sidekick. The emergency room was packed, but thankfully they saw how serious it was & gave Noah a splint right away, and pain medicine shortly after. Grandpa, Grandma, Aunt Dana & Cassidy all came to the waiting room to check on him. Grandma’s iPad was a lifesaver. It took his mind off of everything. I cannot complain about the amount of time we were in the ER. We got x-rays quickly. The x-ray told the story. That’s one ugly break. Noah was terrified of getting a shot (recent kindergarten shots have scarred him, apparently), and he asked about a hundred times if he was getting one. Dr. Anderson decided to give a shot to put him under conscious sedation so that he could set his arm. And let me tell you, that was one loooooong needle in his thigh. They put all kinds of monitors on his chest & gave him oxygen. Bless his little heart, Noah was so upset I wasn’t even sure it would work. But after about five minutes his eyes started getting big and he kept saying, “what’s going on?” Even though I knew he was okay, it hurt to watch that. I never, ever want to see any of my children like that again. 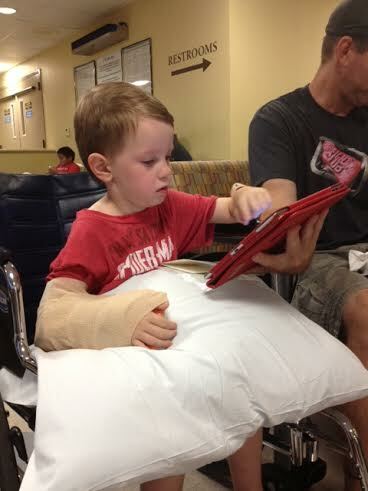 He went under and Dr. Anderson set his arm & put it in a new splint. 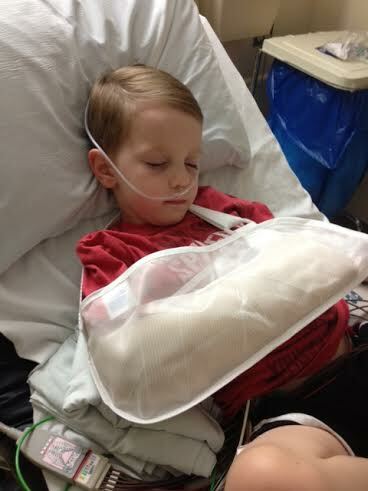 Since it was 8pm and Noah was so exhausted, it took forever for him to come out of sedation. Just look at that angel boy. He was so loopy, it was comical. Apparently he dreamed I was a Lego person, because he kept telling me I felt like a Lego. 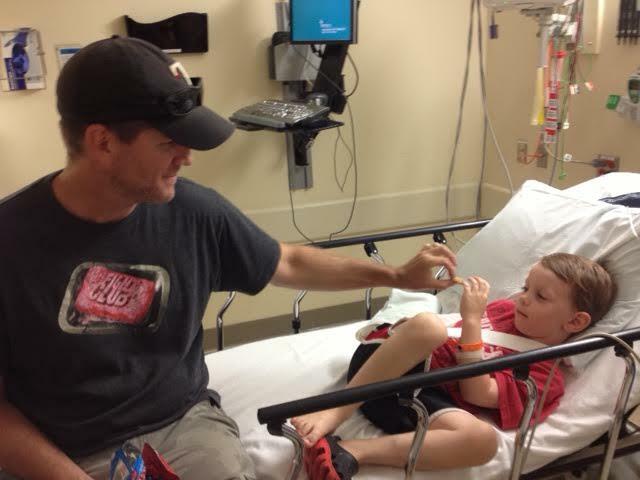 The nurses offered him a popsicle numerous times, but all that boy wanted was the cookies he saw in the waiting room vending machine. So by golly, we got cookies. 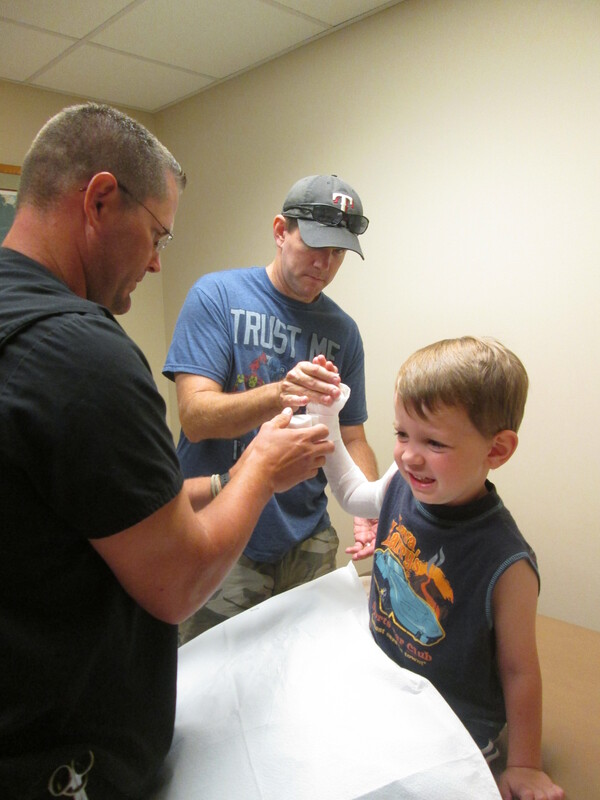 We followed up Monday morning with an orthopedic doctor, Dr. Mumme. We liked him. Thankfully, he didn’t have to re-set his arm again. We really didn’t want to go through all that again. Noah picked blue for his cast color & they went to work. He was trying to be tough here, but this guy was squeezing his broken arm, and it hurt. I was proud of him for being such a big boy. 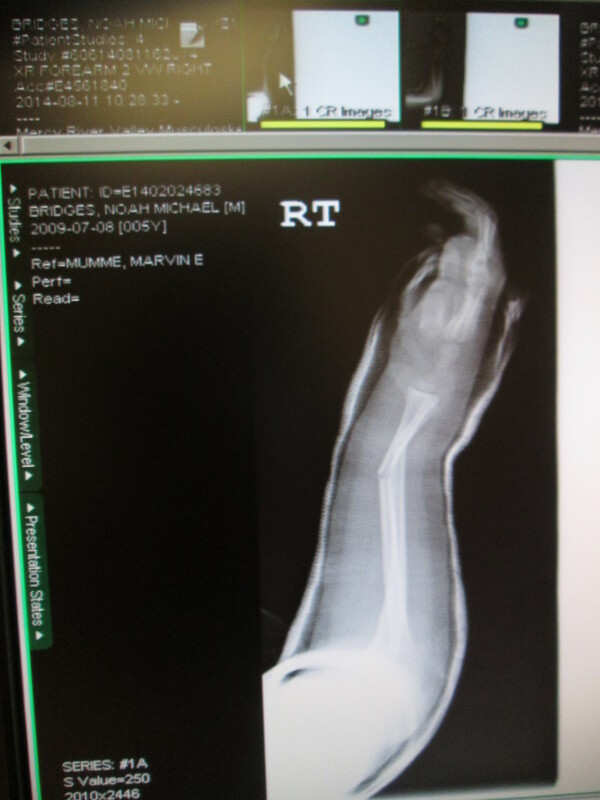 This is after the cast was put on. Eh. 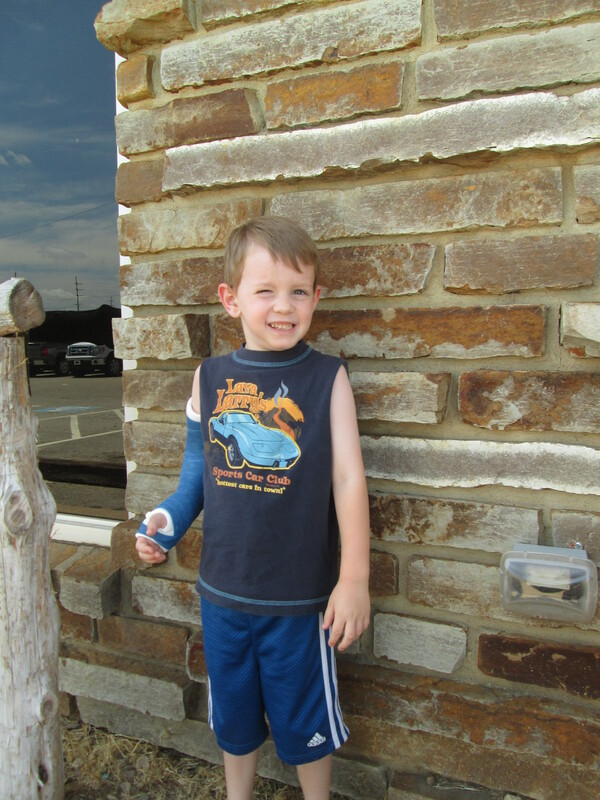 They x-rayed his arm again after the cast and honestly it still didn’t look “right,” but Dr. Mumme said that the chance was very small that it wouldn’t heal up correctly. He said God takes care of these things & the bones usually grow back they way they are supposed to, especially for five-year-old little boys. We follow-up next Wednesday to take another x-ray and make sure. 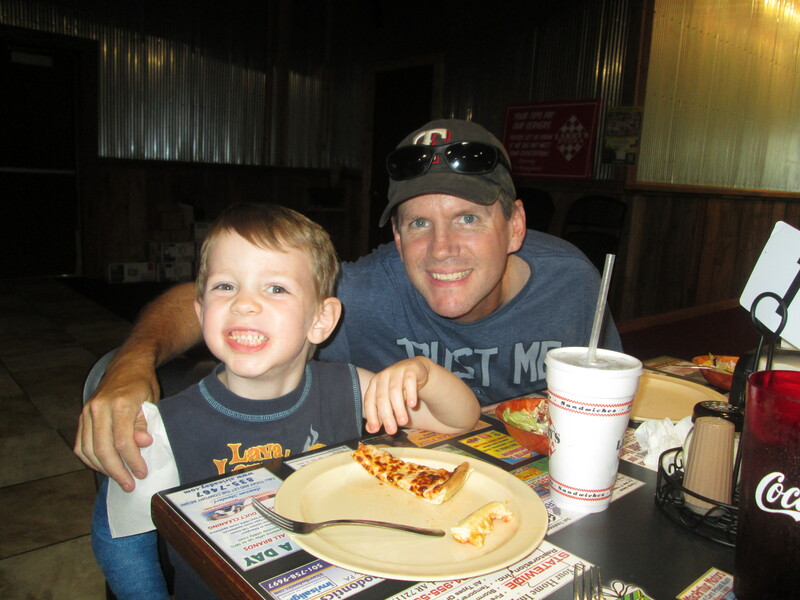 After all that, Michael and I took Noah to Toys R Us to pick out a toy (Spiderman remote control motorcycle), and to Larry’s Pizza to eat and play games. Highlight: He got his own Dr Pepper! We dropped by Stout Lighting to show Grandpa & Grandma the cast, and to feed the fish. A good day overall. I don’t know how to end this post except by saying how proud I am of this boy for trying to be so brave, and for already being so self-sufficient with one usable arm. He has my heart. I didn’t know what those initials meant until I was pregnant with Noah. I always knew I wanted to be one, though, since I was a little kid. Yes, I wanted to be other things, too, but there was never anything more important to me than being there for our babies the first 5 years of their life. I had no idea how I’d manage it, but I always trusted that God would make a way. And He did! Do we have everything we want? No. Do we have everything we need? YES. Do we have more than most? WITHOUT A DOUBT. When I look at the big picture, I honestly cannot fathom any amount of money that would make me return to work before they are off to school. 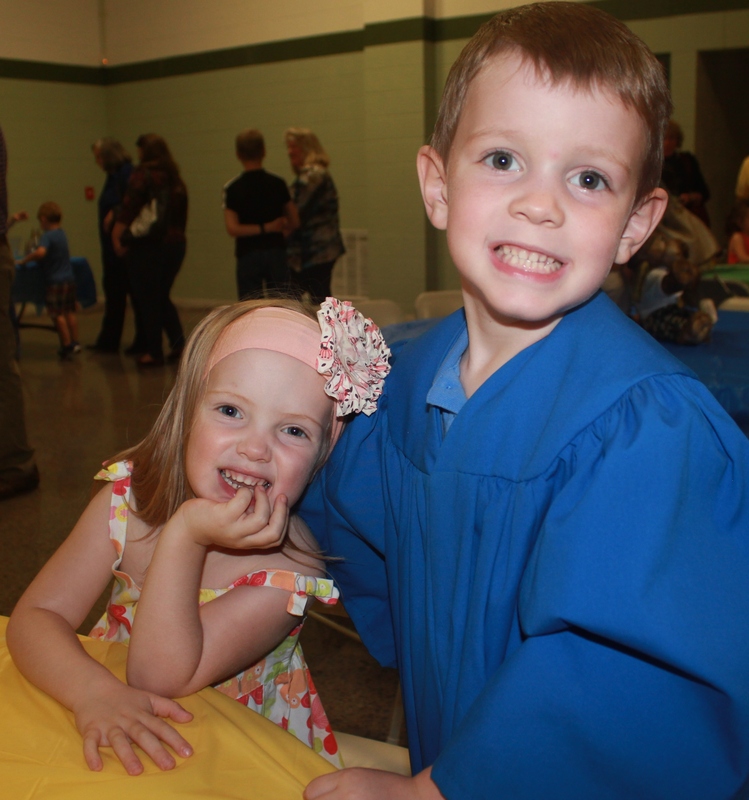 My kiddos are growing up so fast. Things are crazy right now with them being so young, but man is our house Fun. Loud. Insane. Awesome. Manic. Hilarious. Maddening. And I cannot imagine not spending all the time in the world with them that I can. Because before I know it, I’ll blink. And they will be grown. And I will be talking about how much I miss them being this little. Man, I love them. 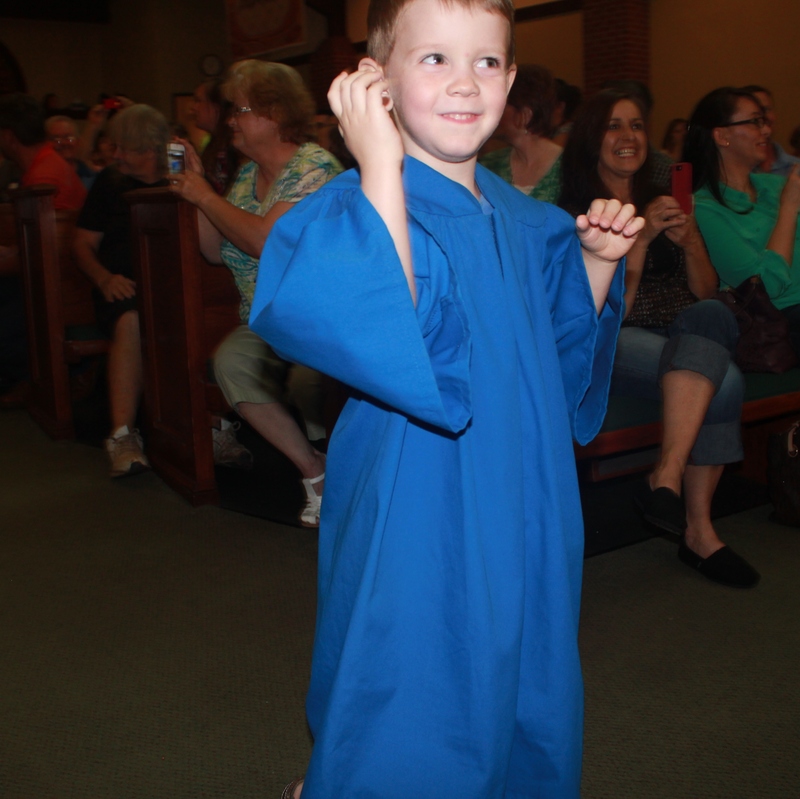 Noah Michael Bridges- Big Preschool Graduate! 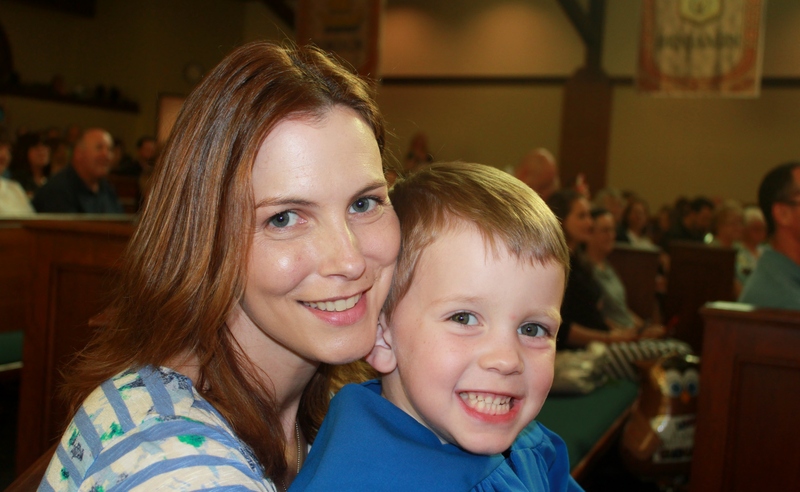 If anything is going to inspire me to write a new post, it’s this boy and his big milestone last week- preschool graduation! 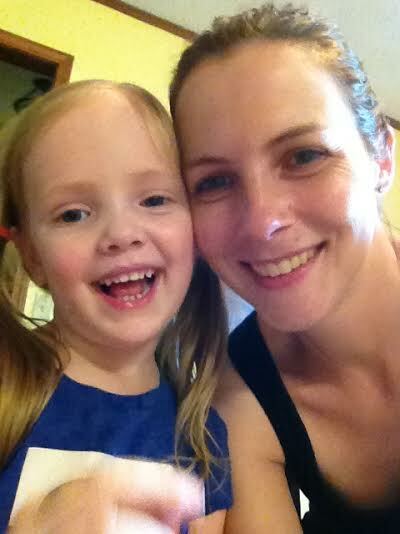 It may not a big deal to some people, but when it’s your little one, believe me it IS a big deal. This has been such a growing year for him! He went from telling me he didn’t want to go to school every singleTuesday & Thursday morning & fighting back tears in the beginning, to actually looking forward to it. 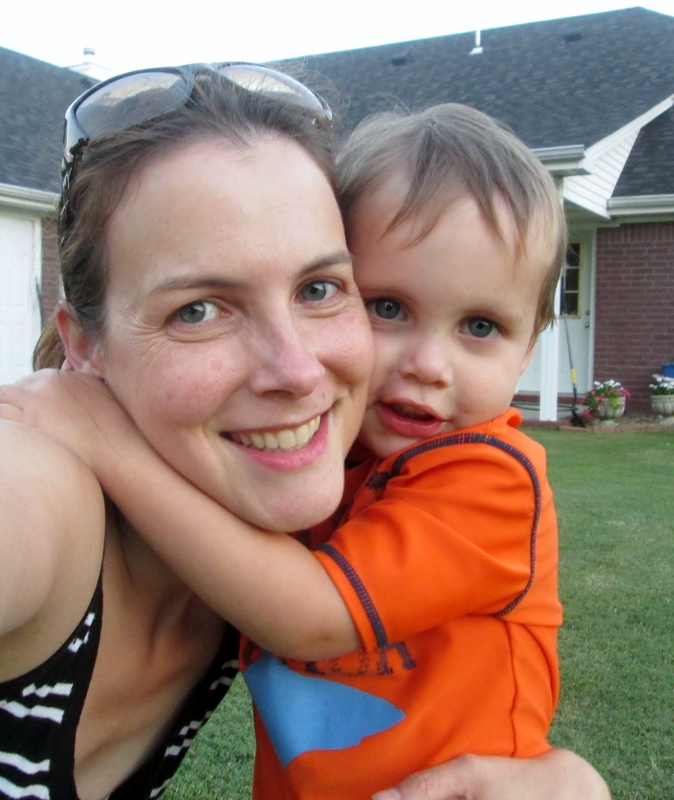 Noah is my first born, and he has been home with me from Day 1. No day care, no babysitters. Church is the only place I left him. 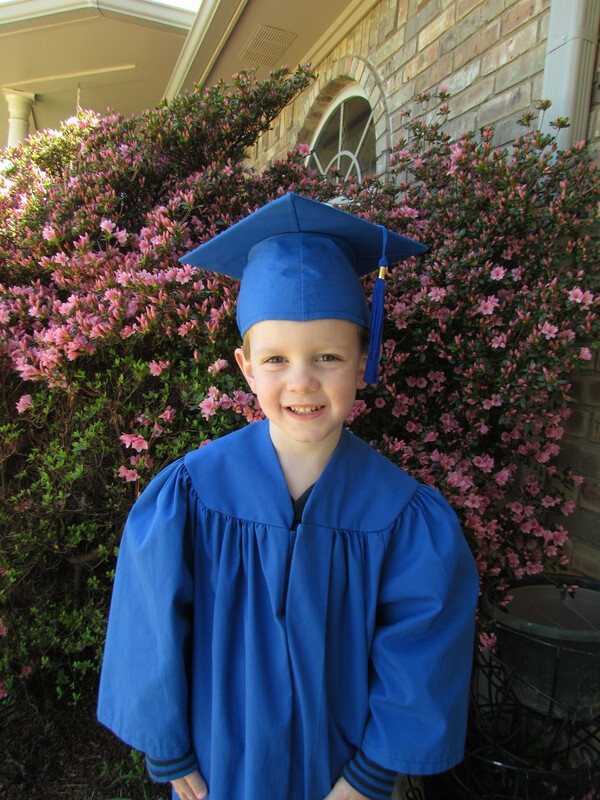 So preschool was a big adjustment for him, and I think that Heritage Preschool was the absolute perfect fit. 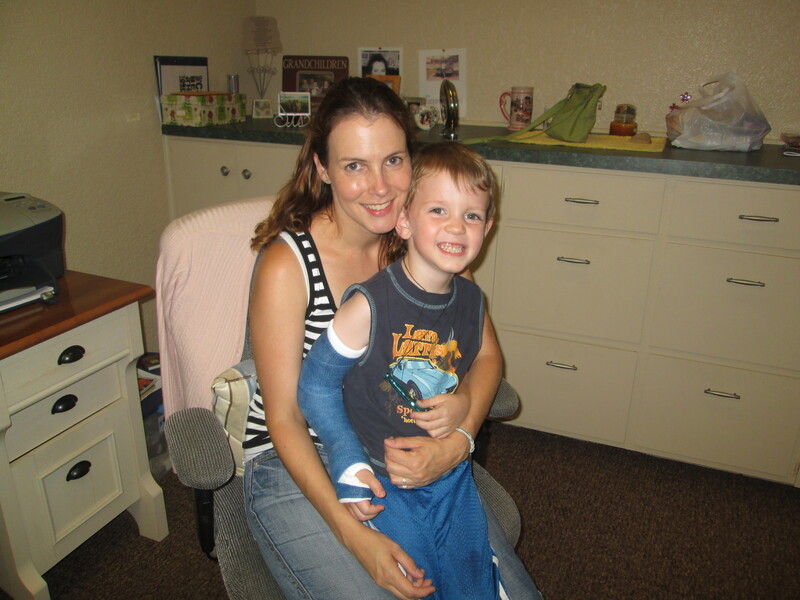 Christian school, wonderful, caring, PATIENT teachers, and only 2 days a week, so it was an easier adjustment for him. They did so many cool things this year, I honestly don’t know how they crammed it all into 2 days a week. 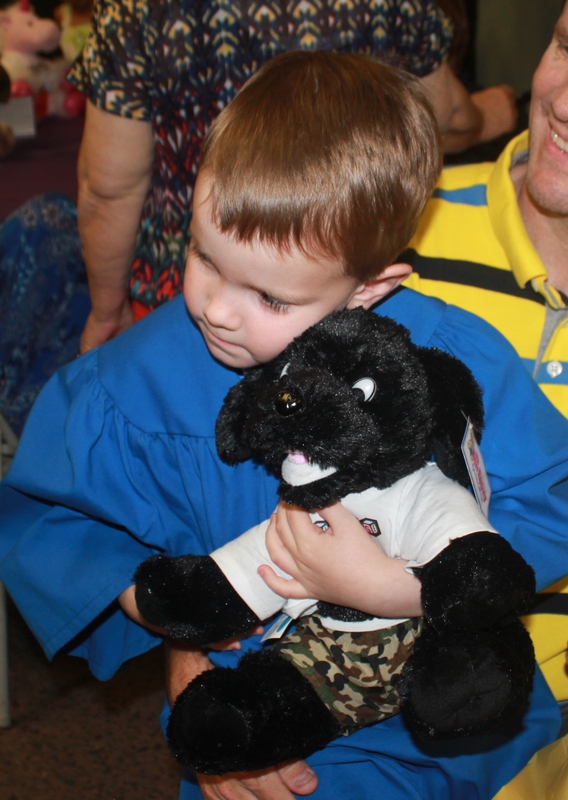 Now he is ready for KINDERGARTEN! So he says. 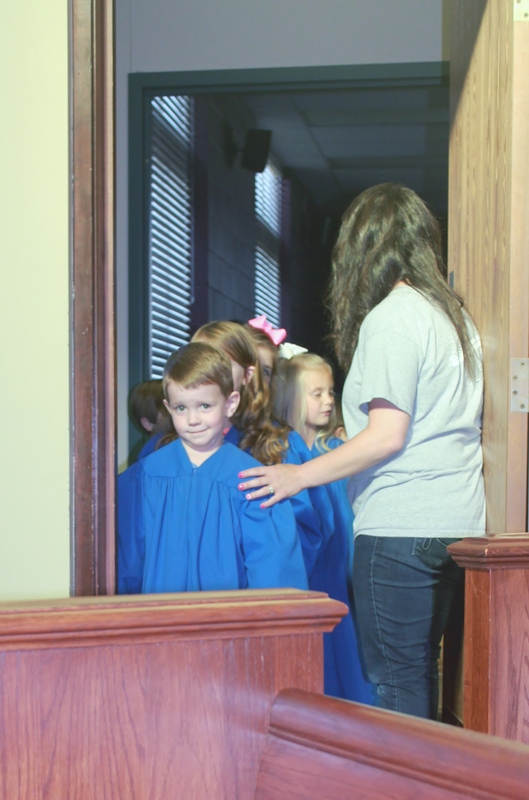 So they sang in their adorable graduation ceremony. 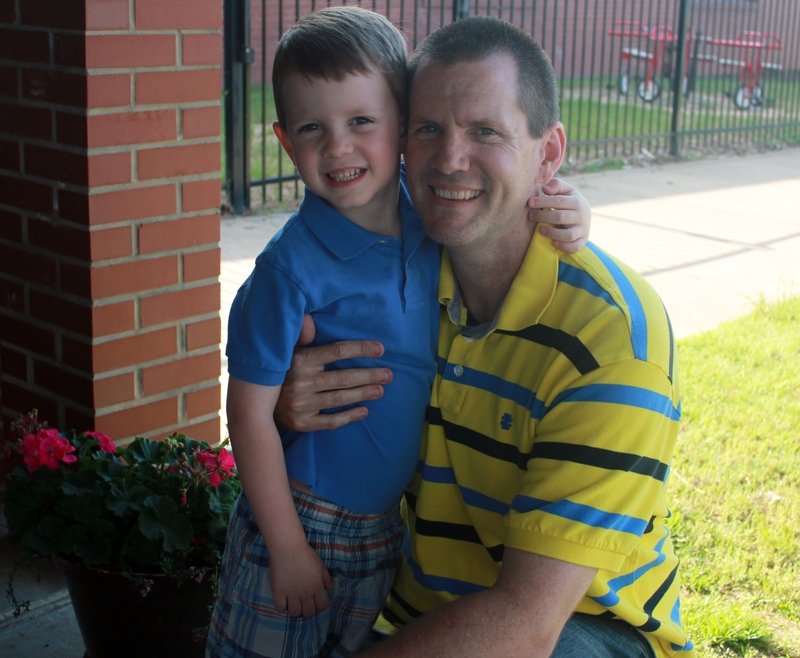 Noah & Daddy before graduation. Noah was pretty excited! Okay, we all were. Hey Noah! I’m right here in the front! I’m the mom who crawled on my knees to the front to get your pic! Yep, that’s me. I didn’t sit in the middle, and actually chose not to crawl across the floor again to get the centered shot. But this is his class singing. 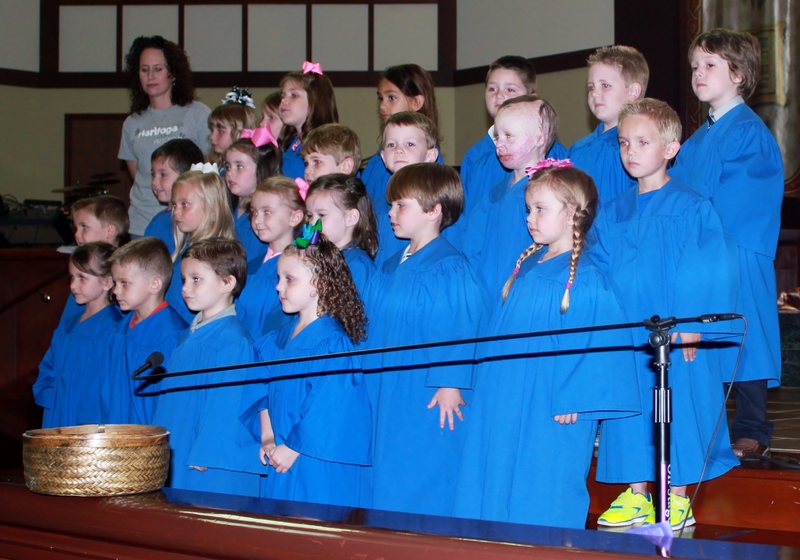 Noah is the second row from top, third from the right. They did so great! I really enjoyed it. 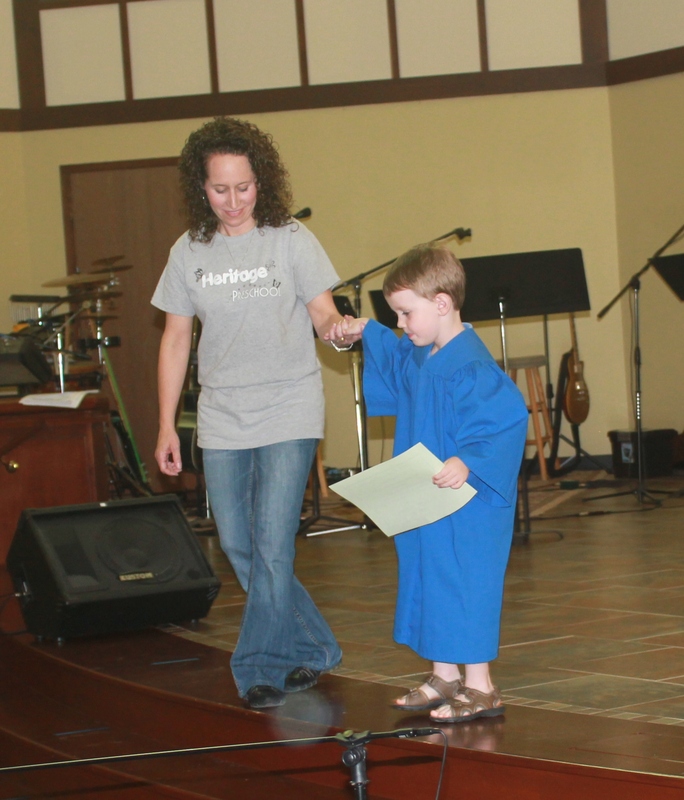 They recited their memory verses from the year (one every month), and also sang the Lord’s Prayer. 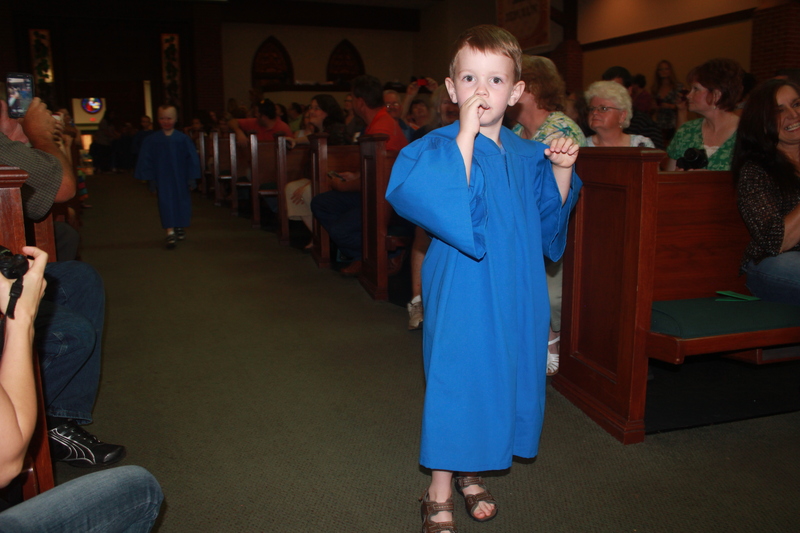 Noah yawned about 52 times during the singing. At least he wasn’t the kid who covered his ears & refused to sing. Getting ready to walk the stage for his diploma. He’s like, the cutest kid ever. 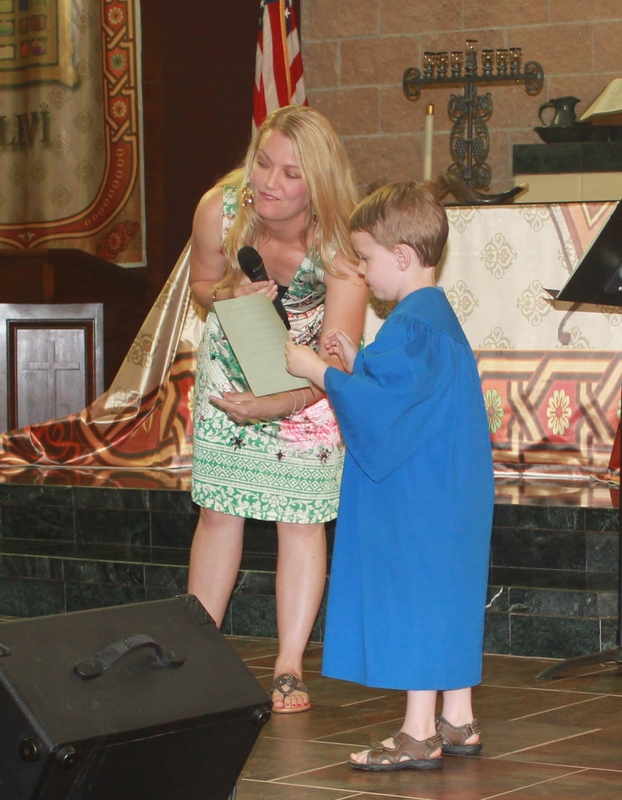 Getting his diploma from Mrs. Erin, and being helped down by Mrs. Amy. 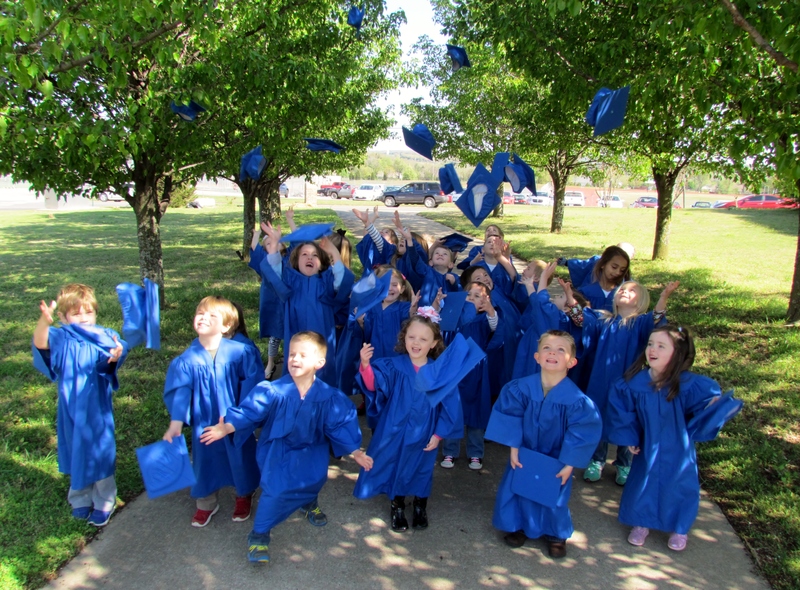 As they received their diplomas, they said what they wanted to be when they grow up. Noah wants to be a teacher. Wonder why that is? Sitting in momma’s lap to watch the rest of the graduates. I could tell he was proud of himself, and that made my heart happy. 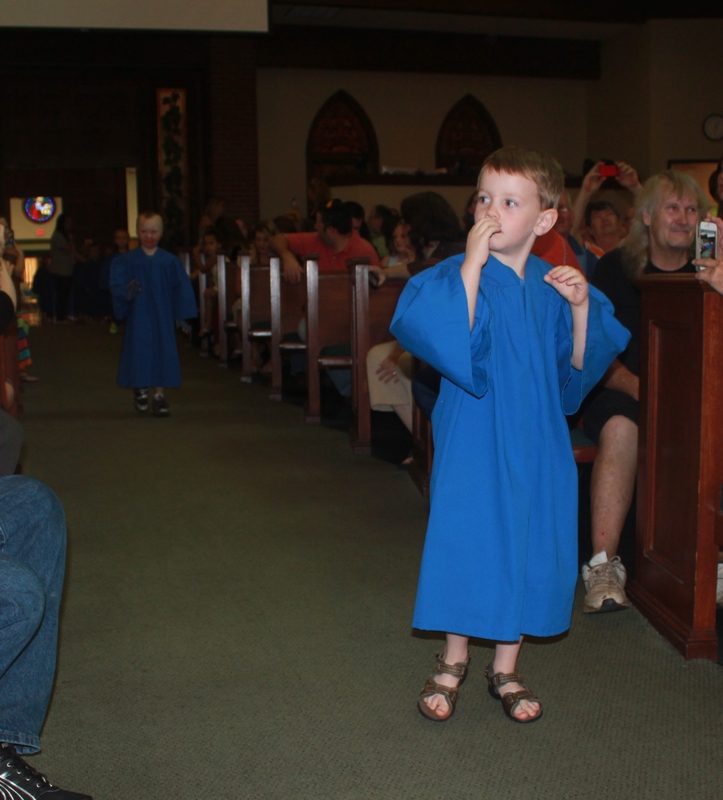 He clapped for all his little friends. 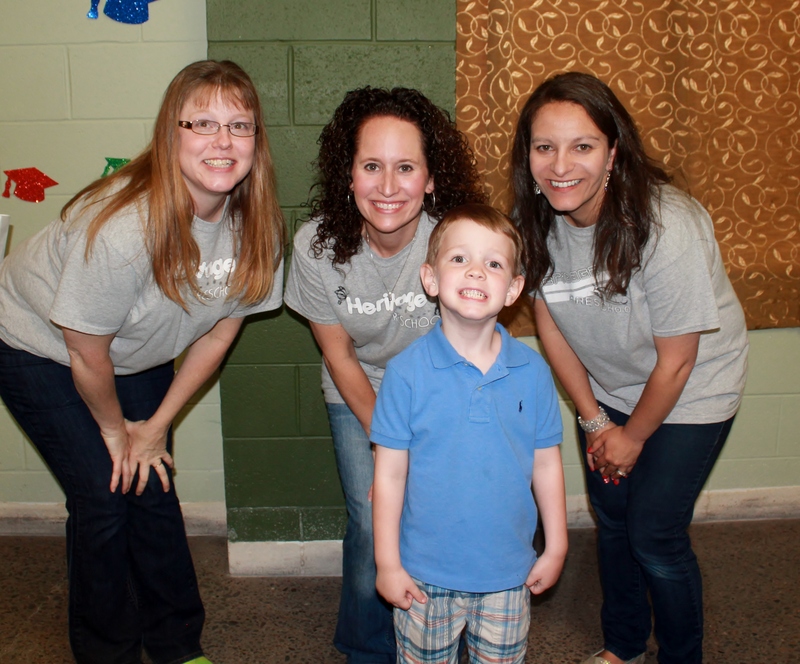 Noah’s most wonderful teachers! Mrs. Traci, Mrs. Amy, & Mrs. Alia. They have been a true blessing for us this year. 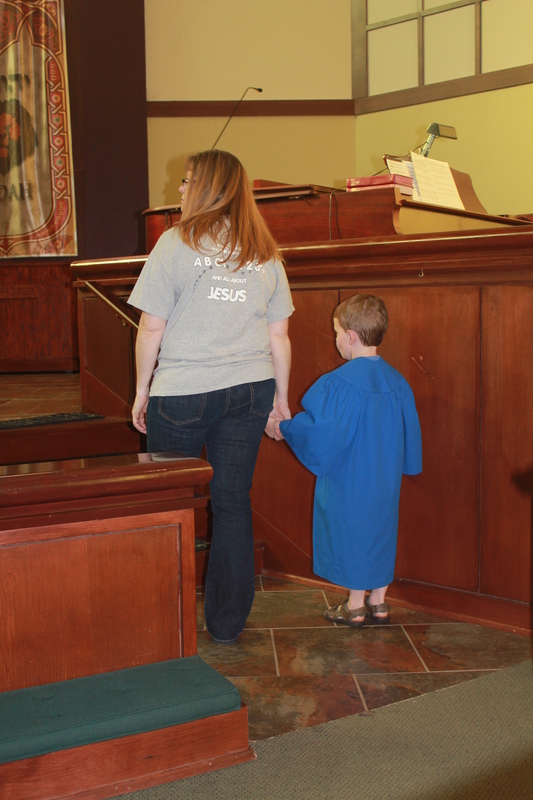 God, please bless these little people & give them great big futures with You! If one more person gets sick in this house, I will run away. Far away. Because it is June, people. Let’s get this straight. Sickness happens in the winter. That’s fine. Nobody cares, because it is cold outside & you want a good excuse to cozy up under a blanket, anyway. But nobody wants to be sick in the summer. In the last 4 weeks, our house has had 5 stomach viruses, 3 cases of croup, 1 night of who-knows-what-but-it-consisted-of-6-hours-of-crying, near-constant teething, and now I have a head cold. My Mother’s Day weekend was awful, and my Memorial Day weekend started in the ER. I have had 3 completely sleepless nights in the last month. I’m too old for that! So listen up, little people (and big husband), I am done with germs until at least October. Do you hear me?! I am not bluffing. I will run away. 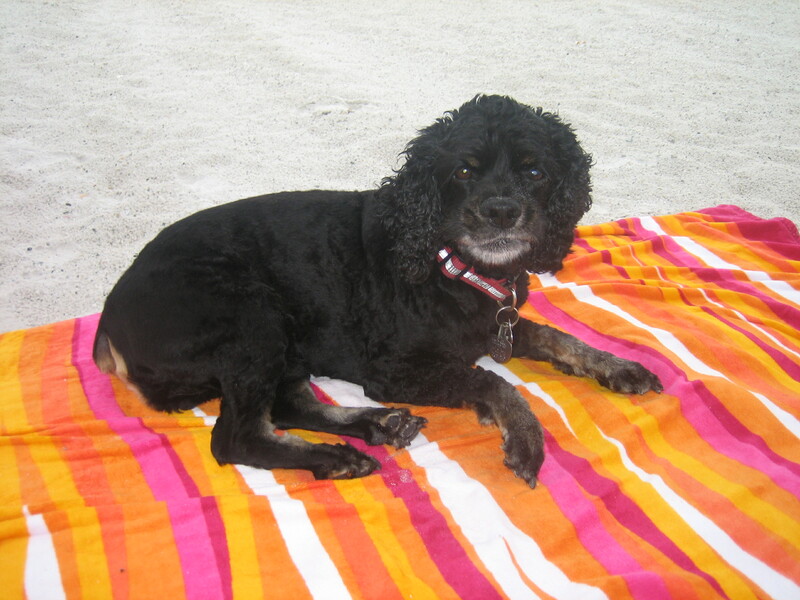 My brother’s 12-year-old dog died last night. Bella. They think she was poisoned, which makes it an even tougher pill to swallow. 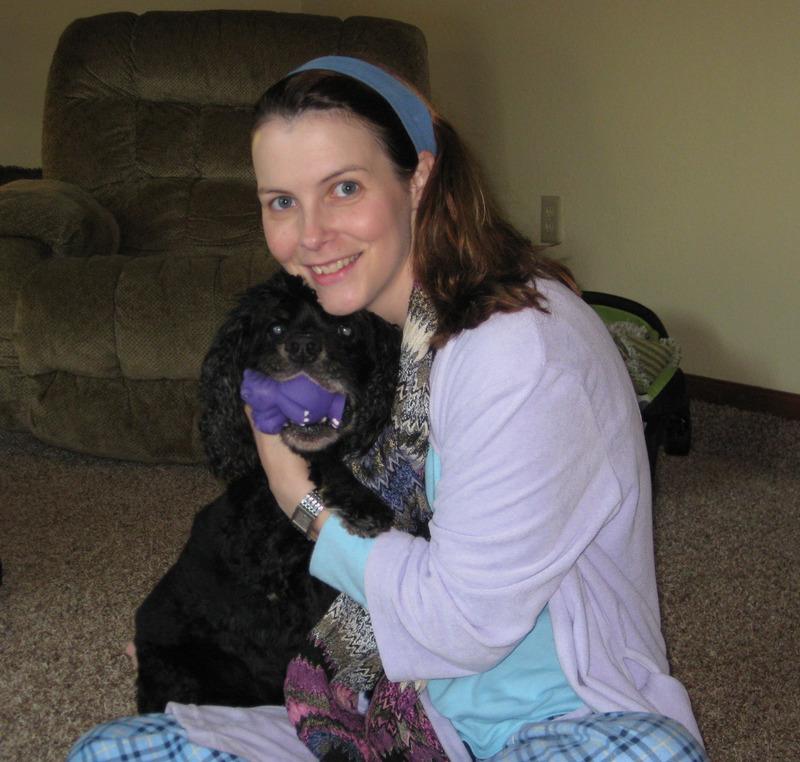 Bella was the sweetest girl, & I will miss her. She was so good & calm, Jared could bring her to work with him. I know Jared & Becky will feel her loss for a long, long time. It’s made me think about my buddy that I lost almost 3 years ago. 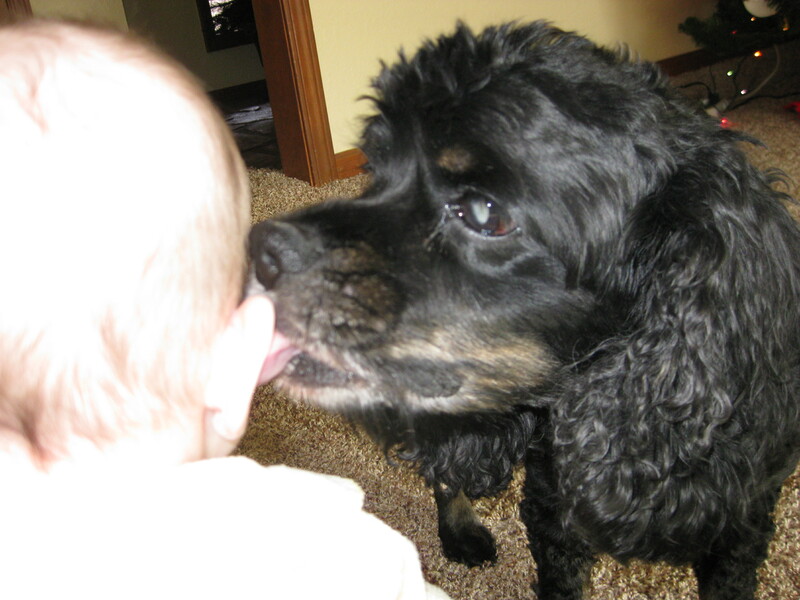 My cocker spaniel, Nick, was my baby, and I was blessed to have him for 12 fun years. I still haven’t gotten another dog. He was so great, it is hard to imagine trying to “replace” him. Plus I have had my hands more than full since. He actually passed 2 weeks after we brought Abby home from the NICU. 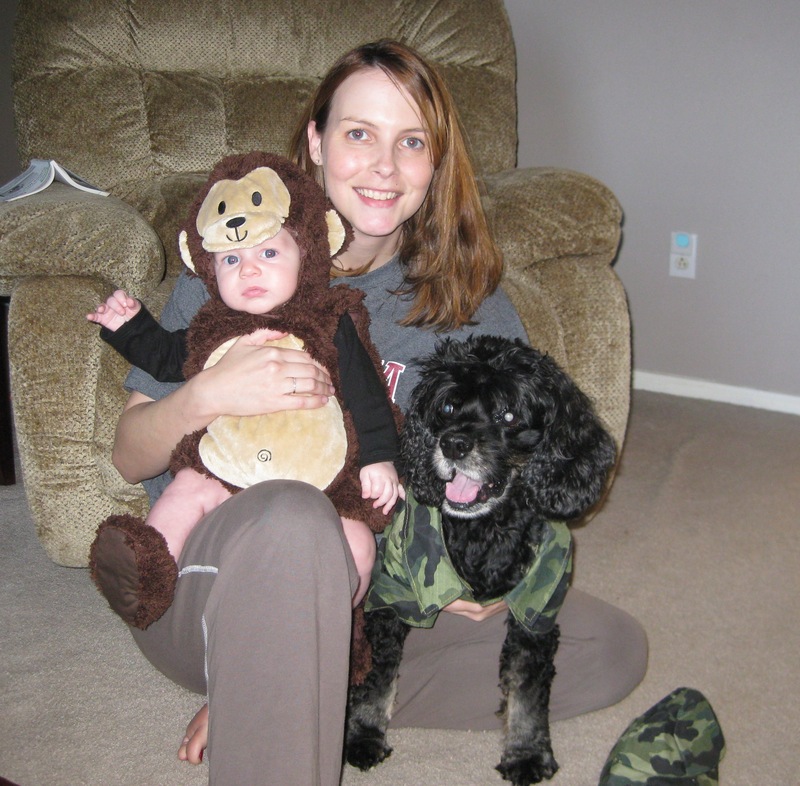 I know that the timing was a blessing, because I had to focus on my preemie & my 13-month-old Noah. Oh, how he loved Noah. And Noah thought he was hilarious. Dressed up for Halloween. Nick sure put up with a lot from me. But hey, doesn’t he look happy? But the house was so empty without the sounds of his collar jingling, his loud sniff-sighs, his happy guh-guh sounds, his scratch at the door to go outside. I miss the way he rubbed his head on me in his version of a hug. His unashamed begging for treats. Taking him to work with me. The smell of his feet (like Fritos, haha). The way he followed me everywhere. 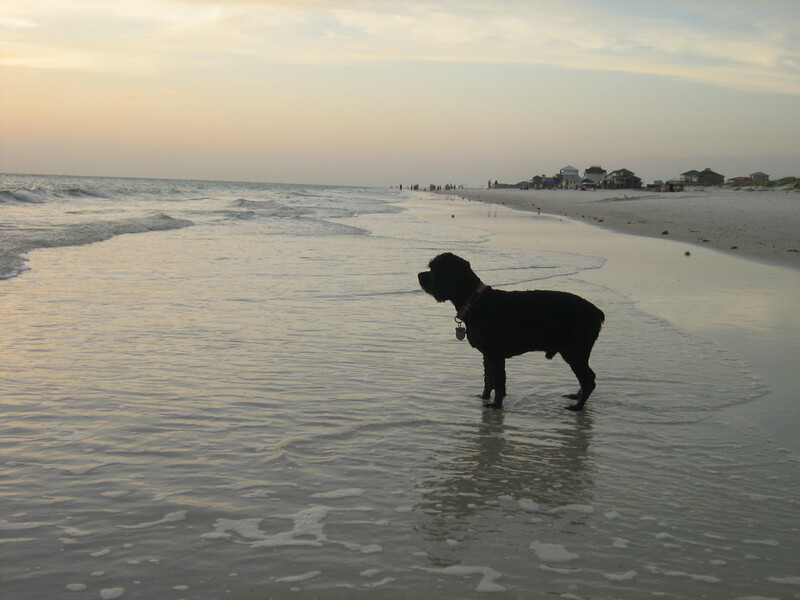 I even took him to the beach with me. He loved it! A beach dog after my own heart. Guess where we spent the night Friday? 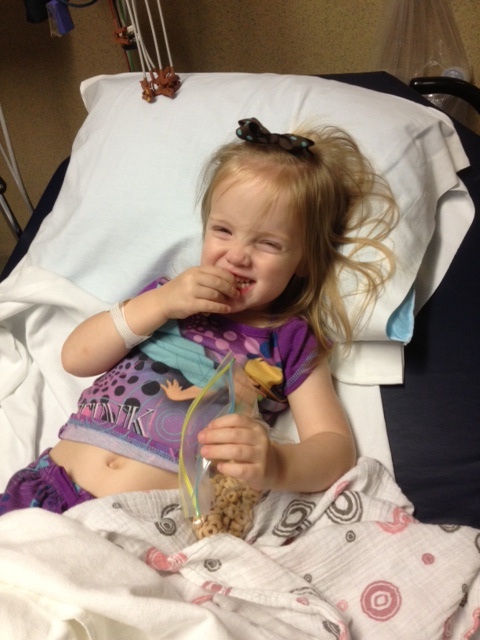 My sweet girl made her first trip to the emergency room. The first of all my kids, actually. 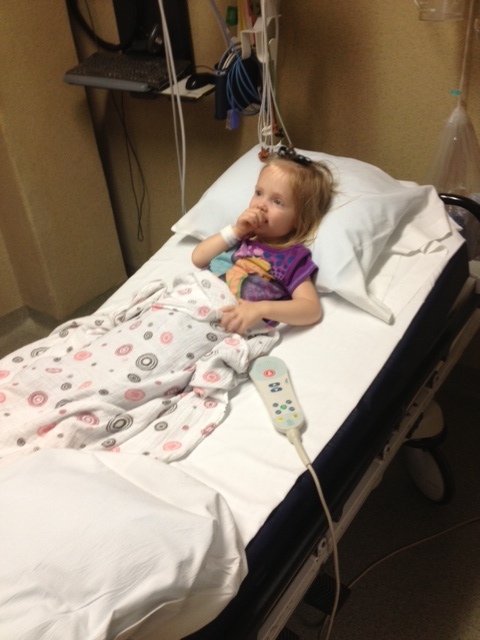 She woke up around 1:30 with difficulty breathing- a HUGE scare for this momma. She was also coughing a really odd-sounding cough. I couldn’t tell if it was an allergic reaction or what, so I first called my awesome sister Dana, who is a RN (so nice to have a nurse in the family!) As I suspected, she suggested the ER. You just can’t mess around with that kind of thing. So we checked into the ER around 230. Only one other person there, so I was hopeful. Though she was still coughing terribly, Abby had started breathing normally by this point, and was a little amped that we were out & about in the middle of the night. So we took some pics. That lady (with a baby) gave up around 330 and left. So I was hopeful that we would get in right after. Nope. We finally went back at 450 am. Abby’s excitement had passed at this point. My precious girl just wanted her momma. At least now she could rest a little in a bed. And thank goodness for Disney! 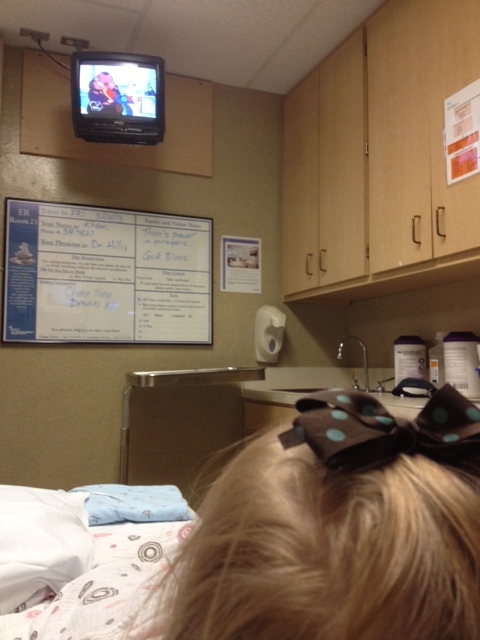 She got to watch Octonauts, Mickey Mouse, and Doc McStuffins multiple times. Also, good thing Momma took a few extra seconds & threw some Cheerios in her bag. They saved the day, big time. At 6 am I went back out & DEMANDED a doctor. Okay, I was polite. But they knew how irritated I was. We had been there 3 1/2 hours, and there was NO ONE THERE! Extremely. Ridiculous. 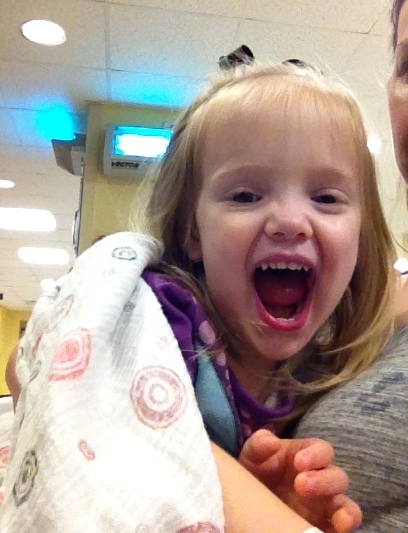 The doc finally comes in & diagnoses her with Croup. Ah, that’s the weird barking cough. Her airways were tight & swollen, so he gave her a steroid to open it back up. We finally crawled into bed at 8am, just in time for the boys to wake up. Good thing Daddy was home! The bad part is, it’s Monday night as I type this, and she seems to be suddenly worse. I think we’re probably back to see Dr Chris tomorrow. Sigh.